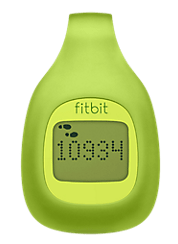 I recently received the FitBit Zip as a part of the Verizon Blogger Ambassador program. I was especially excited for this because I am on a weight-loss journey. And while eating right is a big part, exercise is also great too. The FitBit is really cool because it tracks the time, how many calories you have burned, how many steps you are taking AND it syncs with your phones, tablets and computer. I have synched it with my Droid DNA and my computer. All you need is wi-fi and it automatically synchs. I tried it out this weekend and hooked it up in my sports bra and I tried it on my pants. It worked effectively doing either. I was sweating too and it still worked lol. I walked over 10,000 steps the other day which was almost 5 miles on Saturday. I plan to keep this on me at all times. I am interested to see how many steps I take on an average day. Yay to my weight loss journey! Glad I can track and sync to my phone since I am on my phone 100 hrs a day lol. Check out FitBit Zip and get $5 off !